The Diana Foundation hosted its monthly happy hour at F Bar Houston on March 4 while featuring information about the upcoming 62nd Annual Diana Awards which will be held on March 28 at the St. Regis Hotel. The Diana Foundation has been hosting its entertainment-packed gala event for decades helping to raise funds for local Houston charities. 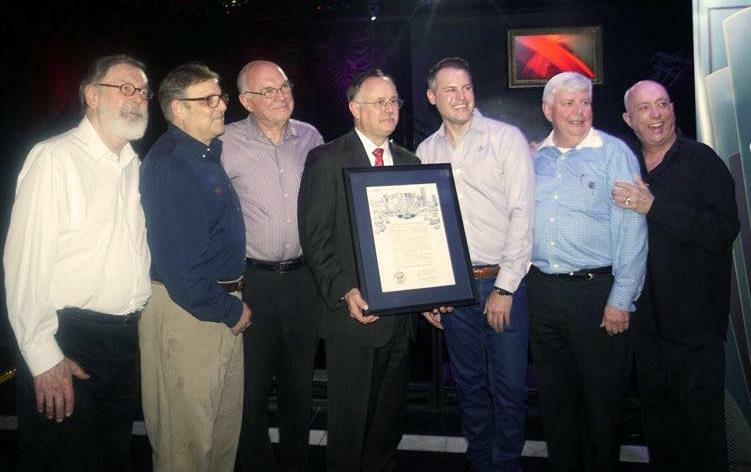 District J City Council member Mike Laster was present at the happy hour and presented the foundation with an official proclamation on behalf of Houston Mayor Annise Parker. The proclamation highlights the rich history of the organization and officially declares the entire month of March as The Diana Foundation Appreciation Month. Foundation has made in the Houston community,” said Laster. The Diana Foundation was founded on March 19, 1953 when a group of friends first came together to watch the first televised Academy Awards. This same group continued their viewing party and presented the first Diana award on March 25, 1954. Since then, The Diana Foundation’s awards show has grown to become one of Houston’s most exciting annual events, and the organization serves as the oldest continuously active gay organization in the United States of America. In 2010, The Diana Foundation presented Mayor Parker with its “The Diana Award.” The foundation created The Diana Award in 1984 to recognize individuals for their outstanding contributions to the Houston community. Details related to the 62nd Diana Awards may be found online at www.TheDianaFoundation.org. Pictured are a grouping of past presidents, the Honorable Mike Laster and current president Tanner Williams. On March 28, 2015, The Diana Foundation will celebrate its 62nd anniversary and awards show at the St. Regis Hotel in Houston, TX. The Diana Foundation was first established by a small group of friends who gathered to watch the 25th annual Academy Awards in the living room of Houston florist David Moncrief on March 19, 1953. The following year, this same group of friends gathered to watch the Academy Awards again but this time celebrated by giving the first Diana Award on March 25, 1954. The annual tradition of hosting the Diana Awards show has continued ever since making The Diana Foundation the oldest continuously active gay organization in the United States of America. In 1976, The Diana Foundation became a 501(c)3 organization for the purpose of enabling its members to make contributions to the needs of the Houston community. Throughout the history of the foundation, Diana members have helped raise substantial funds for area community and civic organizations. These funds have helped local organizations provide valued services to the Houston community. Financial assistance to area charities is focused in the areas of health services, social services and educational & cultural endeavors. The Diana Foundation is an exclusive member organization limited to just 100 full voting members. Diana’s history has shown that members have made important changes to maintain the foundation’s relevance while persevering through numerous challenges. For more than six decades when being openly gay, lesbian, bisexual or transgendered has been perceived negatively in society, The Diana Foundation has forged ahead to give Houstonians an outlet of free expression through large public events and community engagements that have rightfully added to today’s positive views on GLBT rights and the gay community. The City of Houston commends The Diana Foundation for its accomplishments and commitment to the community.